Very well done, my friend! Very Nice! 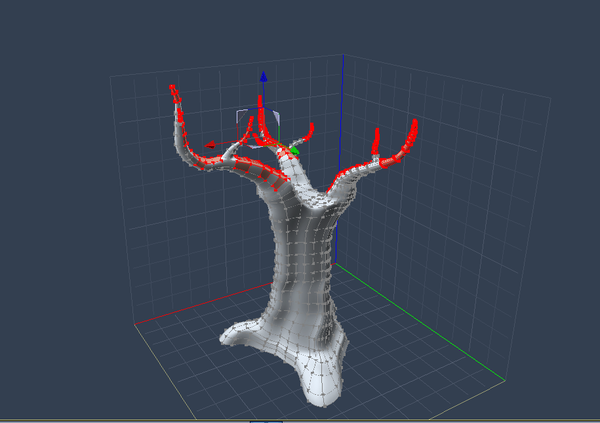 The trunk is a vertex model and I selected certain polygons and made them into a shading domain, then set a surface replicator to use those domains to distribute the Carrara tree I made. The replicator uses no distribution map, just the shading domain. I only need the bottom portion of the tree, so I didn't really work on the top of the tree, although it would be easy to repurpose this for a gnarly old storm battered tree. Ingenious, my ever-so-creative friend! Well done! I think the shaders are just as impressive as the replicators. The bark on the trunk really sells the tree. Well done. Is it a procedural shader or a texture map? I wish I could take credit for it. 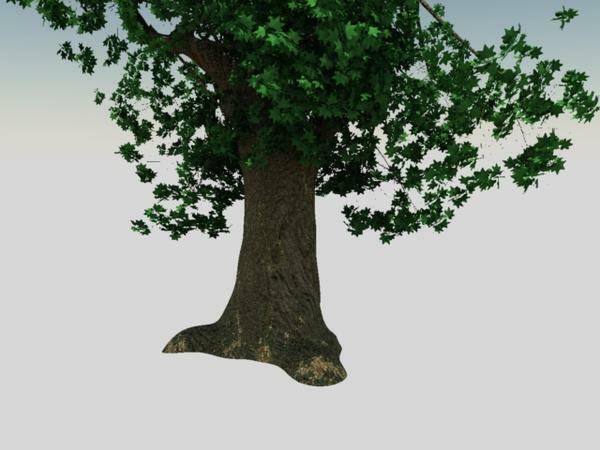 It was based on an idea I got on the old forums about a tree product someone was working on, but dropped because it was very processor intensive, although that was before 64 bit Carrara. I don't recall who it was, but I think that still pop in from time to time, so hopefully they'll see this or someone else that remembers the thread and artist, so I can give credit, where credit is due. The texture is a photo of the bark on the White Pine in my front yard that I made into a tiling texture as an experiment a few years ago. 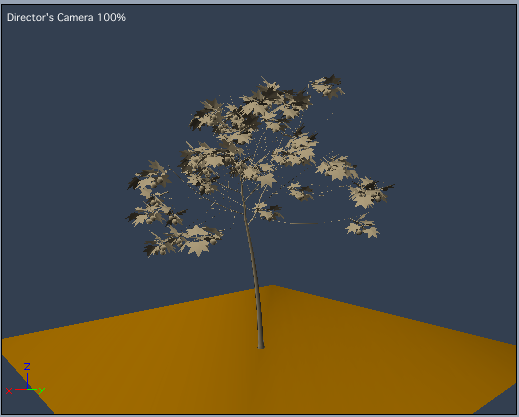 It turned out really nice, so it's my go-to shader for large trees. 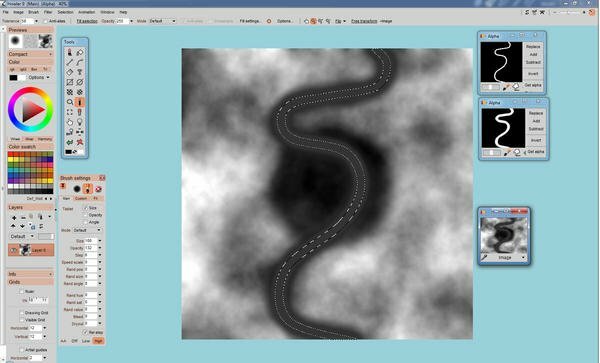 I've also used the textures with multipliers for different effects. Adding some more stuff, and then I'll paint my distribution map for the grass. Or from It's A Mad, Mad, Mad, Mad World (http://www.imdb.com/title/tt0057193). A tip of the hat to the recently passed Sid Caesar. Alas, I found out about this challenge far to late to participate effectively. I should spend more time in the forums I guess. It makes me want to watch the movie again. Trivia (if you trust my aged memory): "The Big W" is still there. One of the trees died or fell down but was replaced a few years ago. "The work in Progress Thread will be open until April 21, at 9pm Mountain Time. The submissions thread will open April 14-April 21 9pm MT. " NICE!!! Very wonderfully done...curious to see how this comes together. I have been working on ways to eliminate the need for replicators for small ground clutter and such things. So the first part sort of goes against part of the rules. BTW, is it okay to use parts of a new, not-yet-released product in the contest? Should be, eh? I am really enjoying the artistic freedom that Dogwaffle gives compared to any other image editor I've ever used. It certainly took some getting used to... but once you explore all of the cupboards for all of the supplies and tools, the whole interface becomes a really cool art room. Anyways, so aside from the car and the blocks of nature I added from the Woodlands kit, the scene was mainly just painted out in Howler and imported onto the terrain, and then I used shader elements from all of my EnvironKits and made what is still a growing Layers List shader, whose process to make was nearly as fun as the rather bizarre method I've used to make the terrain itself. The road looks a little wet because it is. 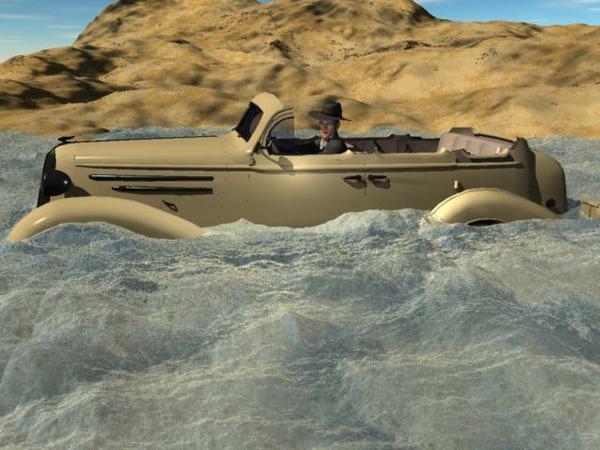 Jeremy Birn was saying that Hollywood directors almost always use water on streets, even if it doesn't make sense for the road to be wet in the scene, just because of lights and reflection. Ooop... gotta go... more later. So the first part sort of goes against part of the rules. BTW, is it okay to use parts of a new, not-yet-released product in the contest? Should be, eh? Don't see any rules violation. The big rules can be simplified to answering two questions. 1) Q - What must I do? 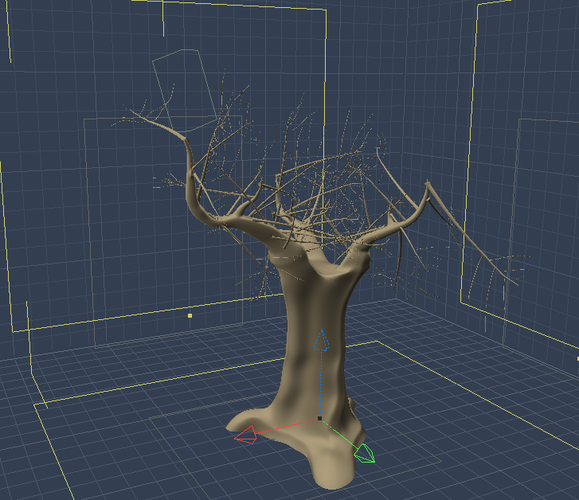 A - render in Carrara and have at least two objects made or significantly enhanced in Carrara, one of which must either be a terrain model or a replicator. A - yes, but it must be credited, and there is a chance that it won't satisfy the two object requirement. There are a couple of little rules, like a requirement to include some WIPs, but not different from prior challenges. ...what counts as significantly enhancing an object? ...if I do postwork, do I have to show the Carrara render? 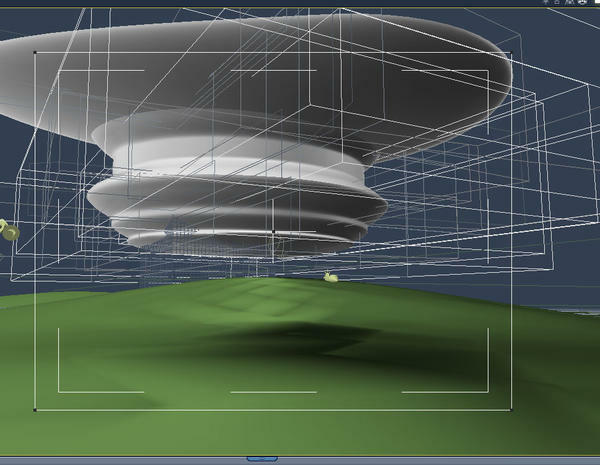 ...if I make the terrain in Bryce or use DCG's ground control, does it count as an enhanced object? ...how many images can I enter? The answer to these questions typically starts with, "yes, you can use/do what you plan, but you have to credit it, and you might also have to do something else to satisfy the 2 item requirement. I don't have dogwaffle, but it looks like your heightmap would satisfy the enhanced terrain requirement. Everything in this one is home-brewed. The theme would be can't fence me in and I was gong to tie it in to the great race as well by titling it, Time Wins All Races. I still have some additions to add, which I will keep under my hat for the time being. The title may give it away, or if you've ever explored the rural mid-western country side, the imagery may evoke a memory of something that used to be fairly common, but isn't anymore. 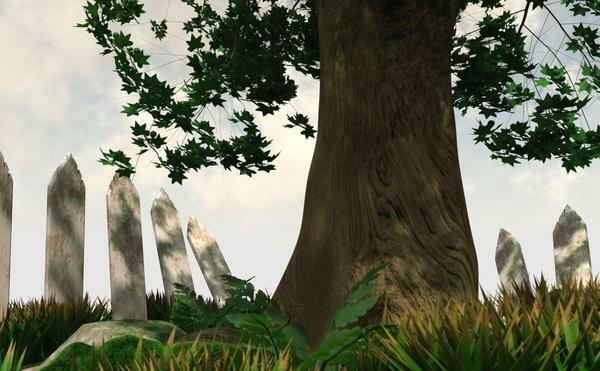 The grass is spline grass and I need to dial down the brown tips in the shader. The fence pickets are also spline objects with a strictly procedural shader. The hair as moss some of you may have seen before. The ferns are for something else I'm working on, but I feel they added variety. I used a replicator for the leafy branches on the tree, a replicator for the grass with a painted distribution map and a replicator on the moss for the reproductive bits that don't show up well in this render but look really cool close up. BTW, the moss is also included as an extra in the Fantasy Village Terrain that I linked to a few posts back. It's not in the scene, but it's in the included objects folder. 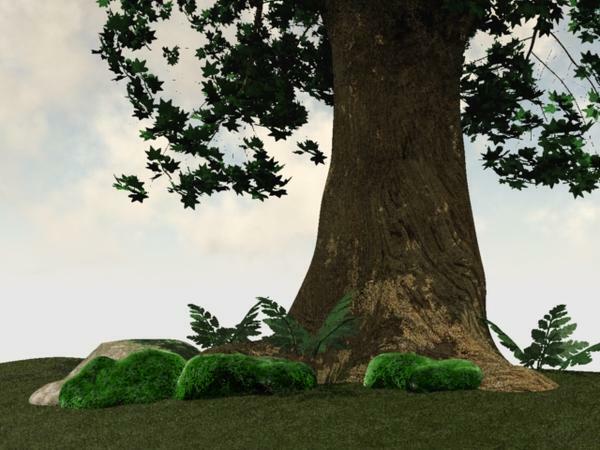 The grass is spline grass and I need to dial down the brown tips in the shader. The fence pickets are also spline objects with a strictly procedural shader. Great job, EP. Once again, I am even most impressed with the shaders. I especially like the weathered look that you achieved on the paint of the picket fences. - and you say entirely with procedural? wow! If I had one suggestion, it would be to have a little more variety in the color of the leaves on the branches replicated on the tree, even if it is all shades of green. You might try a gradient with global settings. Thanks. Great suggestion for the leaves. I'll think about it, but I'm kind of running out of time so I'll have to see if I do have the time. I have another object or two to add and the shading may be a bit more difficult for those. Wow, gone for a few days and lot more entries and they all look great!! Here's another WIP of my scene. 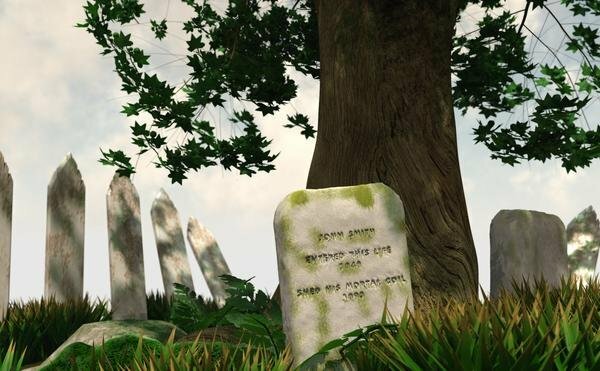 I don't like the lettering on the tombstone as I used a boolean function to cut it into the stone. In one sense it's to clean, and in the other, with the mess created by the boolean operation, it looks not clean enough. So chalk this one up as fail. The look I want is to have the lettering weathered away so much that it is barely visible. 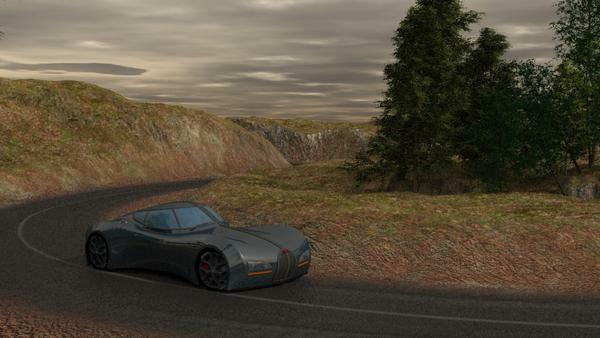 I think the best way to do this would be by panting either a bump or displacement map for it. Not sure if I will stick with this scene, but I will stick with Its a Mad, Mad, Mad, Mad, World in some way. RIP, Sid Caeser. I am leaning towards a Phil Silvers scene. Even the Simpsons thought this scene was worthy of a parody. Yucky right now, but I hope to improve it. Otto: Hey kid! Help me out here. I'll give you a dollar! Otto: FIVE DOLLARS?!?!? Why you little....yeah, yeah, okay, five dollars! Dang, this thread is gonna make dig the movie out of my closet to watch again. I just took on a couple projects, plus I just upgraded my web store the day before my host upgraded the server software last week, so I'm doing a lot of support tickets that start with, Is this me or you? So I hope I can get this finished. 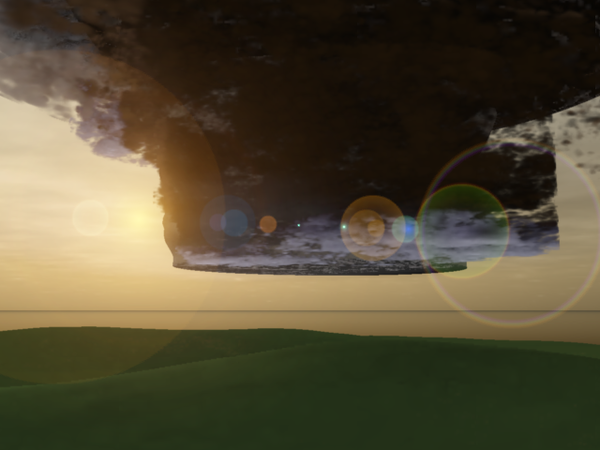 I've been working on the cloud, with a mixture of volumetric clouds, old clouds and vertice items with cloud textures and bumps, then playing with the lights to catch some clouds and the bumps. I originally tried to replicate small clouds all over my cloud object, but it didn't look good, I've attached the WIP image of it. Then I'll work with the terrain next. That is going to be one hell of a storm front. I can't wait to see how you complete it. I am trying to carve out time to experiment with that metaball-blackhole trick you used in the last challenge. I think it could be used to make a tornado. 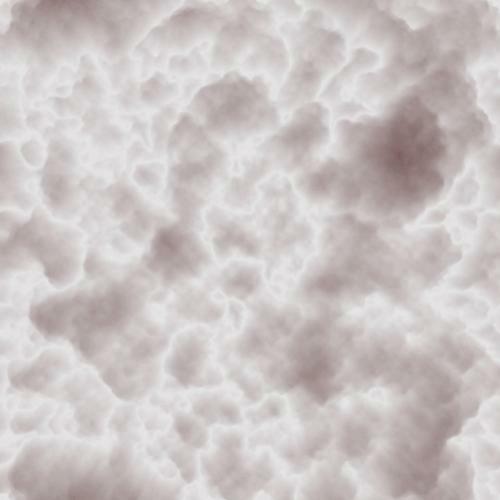 Here's a nifty freebie that uses SSS, glow and displacement to make the clouds. Not suggesting you should use it, but I found just looking at the shader alone worth the download. 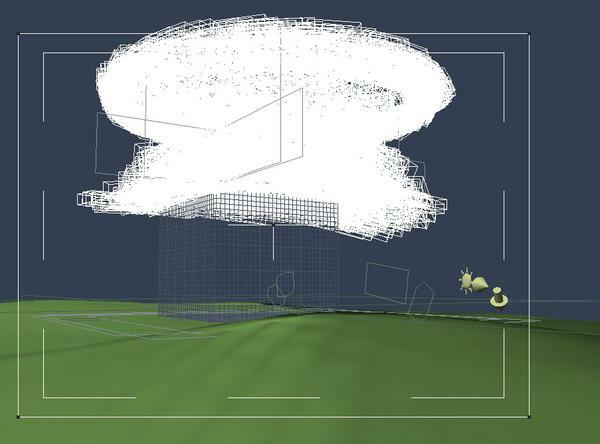 Pay particular attention to the displacement in the shader and then look at the mesh for the clouds. Just a note, there was a thread where I brought up this cloud, and some people using C8.5 had issues with it not rendering properly possibly due to a change in how SSS is handled. Even if the SSS looks like crap for you, the ideas contained in the shader should make up for it.